We investigate the role of the ocean feedback on the climate in response to insolation forcing during the mid-Holocene (6,000 year BP) using results from seven coupled ocean–atmosphere general circulation models. We examine how the dipole in late summer sea-surface temperature (SST) anomalies in the tropical Atlantic increases the length of the African monsoon, how this dipole structure is created and maintained, and how the late summer SST warming in the northwest Indian Ocean affects the monsoon retreat in this sector. Similar mechanisms are found in all of the models, including a strong wind evaporation feedback and changes in the mixed layer depth that enhance the insolation forcing, as well as increased Ekman transport in the Atlantic that sharpens the Atlantic dipole pattern. We also consider changes in interannual variability over West Africa and the Indian Ocean. The teleconnection between variations in SST and Sahelian precipitation favor a larger impact of the Atlantic dipole mode in this region. 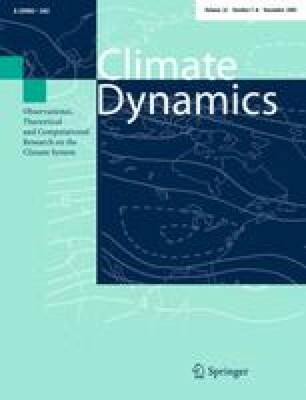 In the Indian Ocean, the strengthening of the Indian dipole structure in autumn has a damping effect on the Indian dipole mode at the interannual time scale. This work was supported by the European funded project MOTIF (EVK2-CT-2002-00153), and from the French Programm national d’etude du climat ECHO. We would like to thank Jean-Yves Peterschmitt for his help with the model fields. This paper is a contribution from the PMIPI working group on coupled simulations.